Emergency situations can occur even in the dermatologist's private office. 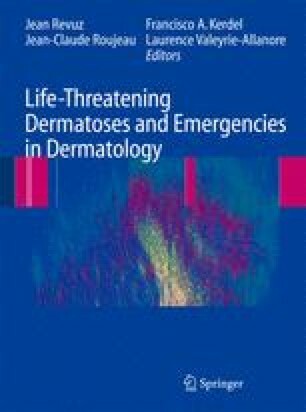 An emergency can be reviewed for dermato-logic conditions: questioning, looking for signs of severity, examining mucous membranes are important. Severe vasovagal malaise may occur during benign procedures. Material must be easy to use, validity dates must be verified. The emergency phone number must be registered and the phone must be easily accessible. Although exceptional, emergencies may occur at anytime in our private dermatology offices. Some of these emergencies may be dermato-logic, i.e. TEN and SJS, DRESS, necrotizing fasciitis, Kawasaki disease, purpura fulminans. Others may be the consequence or a complication of our practice (vasovagal syncope, ana-phylactic shock) or be independent of the practice but occurring in our office (i.e. seizure or cardiac arrest). This chapter will consider all these situations. Equipment and prevention will also be studied. Our purpose is to recognize these situations at their beginning in order to undertake appropriate emergency procedure.